Any event or special occasion you create can have up to 5 email reminders attached to it. Reminders can email you of important upcoming dates from 1 to 90 days in advance. To set up a birthday with reminder, go to Settings, then click the My special occasions link. Click the Create a new occasion button and enter your event information. When you enter a start year, the system will include the current age of the occasion in your calendars and email reminders. Click the Add a reminder link. A new reminder is created and you can set the number of days in advance to receive the reminder by email. Click the Save occasion button and your reminder is set. 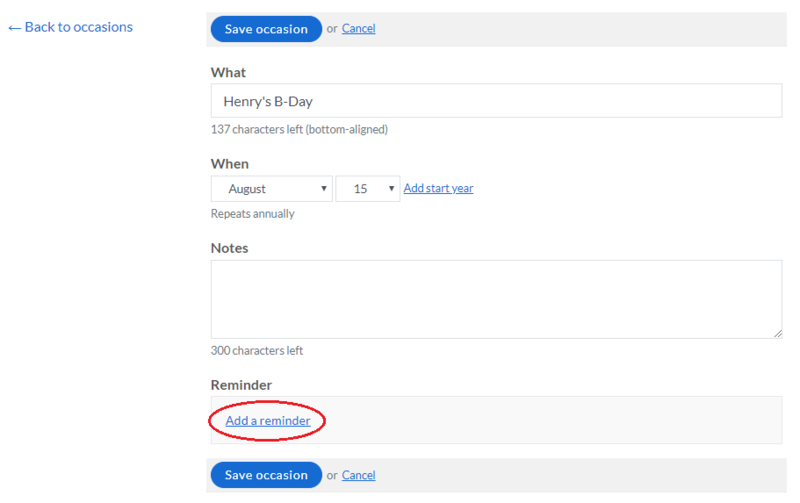 The special occasions page lets you easily manage your birthdays and anniversaries, as well as specify whether your special occasions appear top-aligned or bottom-aligned in your calendars. You can also manage the reminders from your schedules by clicking the My reminders link at left. Have a question not answered in this tutorial? Ask us and we'll get back to you shortly (normally within 1 business day).